After owning and operating a highly successful Kawasaki motorcycle dealership in Perth for twenty years, Bruce sold up in 2005. Free from all responsibility for the first time since his teens, Bruce decided to live the dream, picked up a 31 foot Kevlacat in Noosa and spent a year cruising up the Great Barrier Reef. Boating, diving and fishing are his lifelong passions. Anchored at Thursday Island he concluded that a larger vessel with greater endurance might be more suited to offshore cruising. 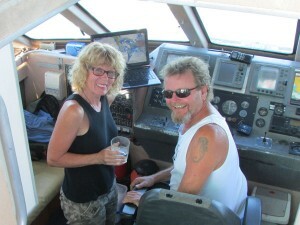 A fantastic 2 week charter on board the Undersea Explorer finally inspired Bruce to plunge in at the deep end. Returning to the West coast, he purchased Unreel Adventures in 2007. With a solid understanding of the importance of great customer service, Bruce has been steadily developing this already successful company. If you enjoy your experience half as much as we do, then you will have a ball! Passionate about her food and life in general, Stephanie was born in England and grew up in Sydney. She soon developed a taste for travel and began her adventures traveling up and down the east coast of Australia before settling in Darwin for eight years. Bruce has lured Stephanie from a comfortable life in the suburbs of Perth to be his life-long partner on the high seas, where adventure and the seduction of the Kimberley region has proved too hard to resist. 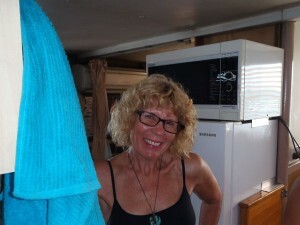 Stephanie loves to create delicious meals and help to make our boat a comfortable home for all to share. After retiring from the RAAF, Kim also chose to live the dream and purchased a fishing charter vessel operating out of Fremantle. As our season from April to October is the off season for Kim down south we are fortunate enough to have him on our team. 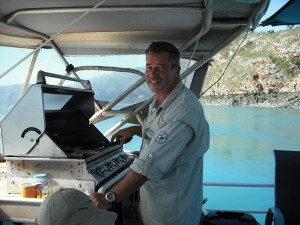 Kim is an experienced Fishing Guide and Skipper and is a valuable member of our Unreel Adventure crew. class="page-template-default page page-id-50 samba_theme samba_left_nav samba_left_align samba_responsive wpb-js-composer js-comp-ver-5.7 vc_responsive"